Depending on details of its design, an optical resonator is either stable or unstable with respect to transverse beam offsets. If it is stable, any geometrical ray injected into the system with some not too large initial transverse offset position and angle will stay within the system during many round trips. In an unstable resonator, such a ray will be ejected sooner or later. The modes always experience significant diffraction losses, which are often very high (order of 50 % per round trip or higher). The diffraction losses generally become higher for higher mode orders. This intrinsic mode discrimination can help one to obtain single transverse mode operation of a laser. Particularly for resonators with diffraction at hard edges, the transverse mode profiles are very complicated and usually exhibit pronounced ring structures. Only numerical methods can then be used for calculating the detailed mode profiles. For some soft-aperture resonators (see below), however, the mode properties can at least be estimated with reasonable accuracy using analytical methods. In a linear unstable resonator, the wavefronts of the counterpropagating beams do not necessarily match each other, and they do not necessarily match the surfaces of the two end mirrors. The attribute “unstable” should not be misunderstood as stating that such resonators are less robust than stable ones. To the contrary, the alignment sensitivity of unstable laser resonators can be even substantially lower than for stable resonators, and rather robust high-power lasers have been developed with unstable resonators. Unstable laser resonators are usually made such that the mentioned diffraction “losses” are taken as the useful laser output. The output coupler can be an ordinary laser mirror where the field distribution extends beyond the mirror edges, so that some light passes the mirror on the sides (see Fig. 1). Although the output beam profile has a hole in the near field, the beam divergence is quite small, and the beam quality for some very high-power lasers with such resonators is at least higher than achievable with stable resonators – particularly if large diffraction losses can be tolerated, so that the hole can be made relatively small. 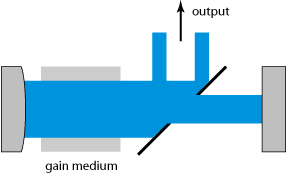 Figure 1: An unstable laser resonator with output coupling at a hard-edge mirror. In other cases, a scraper mirror (Fig. 2, e.g., a tilted mirror with an elliptical hole) is used, which “scrapes off” some light from the circulating intracavity beam. Figure 2: An unstable laser resonator with output coupling at a scraper mirror. Another possibility is the use of a variable-reflectivity mirror, where the reflectivity decreases with increasing distance to the beam axis – often according to a Gaussian or super-Gaussian function. This approach can avoid the otherwise typical ring structures in the near-field output beam profile and is often suitable for obtaining a rather high beam quality. In some cases, a resonator is stable in one direction and unstable in the other direction. Such hybrid resonators are sometimes used in situations with highly elliptical beams . Although most laser resonators are designed as stable resonators, unstable resonators can have substantial advantages in certain cases. In particular, they can help to generate a laser beam with very high optical power and still relatively high beam quality. A frequent problem with stable resonators in such cases is that a large enough fundamental resonator mode cannot be realized, or that this mode is highly sensitive to disturbances like thermal lensing or misalignment. An unstable resonator, however, can have a very large fundamental mode with a substantial net gain advantage over all higher-order modes, and with no excessive sensitivity. However, this principle usually works well only when the gain medium can provide a rather large gain. This can be the case in pulsed flashlamp-pumped or diode-pumped YAG lasers, in metal vapor lasers, excimer lasers and chemical lasers, for example. The application to low-gain lasers such as CO2 lasers or continuous-wave lamp-pumped solid-state lasers is more difficult and often leads to a lower beam quality.